Minimum wage rates are rising around the country. Some regions are lifting it higher than the United States has ever seen ($15.37 in Los Angeles), while other regions have more…shall we say… modest plans (Georgia and Wyoming employers pay their lowest compensated workers $5.15/hr). Five US States, all located in the South, have no minimum wage requirements at all, which means they have to adopt the Federally mandated level. But national momentum is clearly in favor of a financial floor beneath which no worker can fall, and most of the United States have unified in this effort. So why do we have a minimum wage at all? And who does a minimum wage benefit the most? These might seem like no-brainers, but the actual history and statistical analysis of minimum wage culture has a few surprises. Congress created the first national minimum wage in 1938, at a whopping 25 cents per hour. However, they have been very adamant in showing the public that they are fighting for the rights of the people who have jobs. Since then, Congress has bumped up the Federal minimum wage 22 times, most recently in 2007 and 2009, at $5.15 and $7.25, respectively. Some citizens are able to outpace the Federal minimum wage level with increase in employment compensation, through efforts like an MBA from Russell Sage Online. Others are not. Many bills have been introduced, but none have been turned into law. Since 2009, the Federal minimum wage hasn’t budged. But in all times, states have had the right to install minimum wages that are higher than the federally mandated minimum. With Congress long overdue for another Federal increase, today 29 states have voted to increase the minimum wage standards of their lowest-paid citizens. Congress tends to boost the Federal minimum wage when the economy is improving and when there is little unemployment. With the recent stock market drop and an election on the horizon, it’s likely we won’t see increases in the Federal minimum wage in the next few months. So it’s the States that are leading the charge. Among them, the District of Columbia, Washington, Oregon, Vermont, Connecticut, Massachusetts, Rhode Island, and California round out the top 8, all of them with a minimum wage of at least $9.00. But in some cases, individual cities support the charge, New York City and Los Angeles at the vanguard. We’ve already covered the LA situation, and Mayor DeBlasio has proposed a minimum wage of $15 for NYC. Chicago and Seattle are among the many other cities considering a higher minimum wage than demanded by state law for hired service or services. Legislation has been batting around Congress for several years, which would raise the Federal minimum wage level to $10.10, with many opportunities for continued increase in the following years. Though it is unclear when this might become law, it’s assumed that 28 million workers would benefit from such a decision at the Federal level. That’s how many people currently work for less than $10.10 an hour, which is something that many are calling a national embarrassment. Adjusted for inflation, the minimum wage has fallen by nearly a third since 1968. These 28 million people include many servers who frequently make between $1-3 before tips. In California, individual cities have instituted a non-docked minimum wage for these servers, meaning that they now receive the same minimum wage standard as all other workers, even before tips are counted. 88% of the workers affected would be over the age of 20, and 55% would be women. Though many pundits have speculated that a higher minimum wage would result in reduced employment, independent studies do not agree. Despite recent economic tumult, it seems that the time for an increased Federal minimum wage has come. You can bet that this will be a part of government election discussion, and an important ramification for whomever is elected. 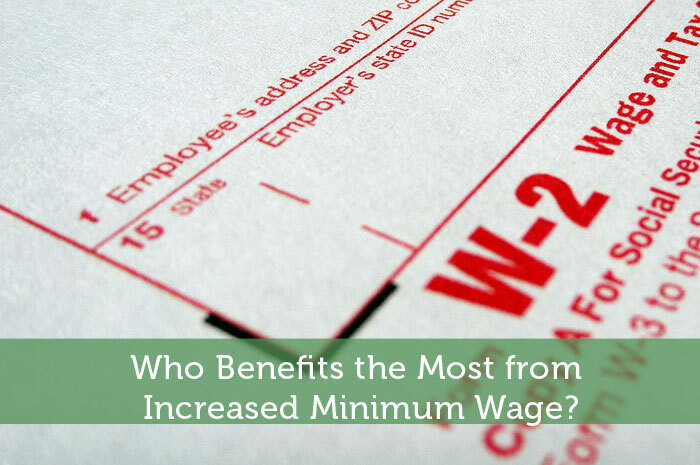 Who Benefits the Most from Increased Minimum Wage? I love how people think that it’s uneducated, slack-jawed yokels working in fast food (so why should they get $15 an hour???). While I can see instituting an age-based minimum wage (those under 18 wouldn’t have to be paid as high–but you also could limit how many under-18 employees a job hires) anyone over 18 has to pay bills. The sad thing is there are tons of fast food restaurants across this country that pay low and keep the pay low for years. Most horror stories I hear are from franchisee-owned restaurants, specifically McDonald’s. Not only do they keep paying employees below-$10/hour, some have forced employees into pre-paid debit cards for their paychecks which have atrocious fees that eat into their already paltry paychecks. I think a big problem with American culture as a whole is that we don’t have a “support our brother” mentality. It’s that, “If I didn’t make $15/hr minimum wage, why should she make that much?” view. I don’t understand why as a society we became so individualistic. Why wouldn’t we want our brothers and sisters to be paid good wages so that they can better themselves, their families, and their communities (which in turn, benefits us too)? I’m sure it benefits many, but it can also have negative effects. Businesses that are forced to increase wages (including small businesses) may have to increase prices or lay off workers to be able to maintain profits. For a small business that is imperative. Some may say for corporations, they can afford it. They probably can, but they’re profit margins affect investors too. Raising minimum wage for the worker, may then cause drops in dividends, which many elderly use to live on (and I believe many in the early retirement camp are hoping to live on). Also, if minimum wage goes up, it dilutes what existing employees are making. For example somebody making $20/hr (which is not wealthy by any means) is not going to get a similar bump in their wage. If someone is making that amount after having to work their way up for many years and then a 16 yo with no work experience can make just $5 hour less, why bother trying to work your way up. I mean if the standard is going to be $15 today why not $20 in two years, then $25 two years after that. There is no external incentive to move up. I can do the same thing day in and day out and expect the government will ensure I have a “living wage”. If someone isn’t internally motivated to move up (the idea is that a minimum wage job is where you start your career) you are taking away any external motivation. Then we have a bunch of people that just expect raises without the hard work to deserve it. How about those that do work their tails off and get a whopping 2% increase a year (I believe that is the average merit increase in this country). Meanwhile, someone making minimum wage is going to get a 48% increase. Not that the person doesn’t deserve a raise and doesn’t work hard, it’s still quite an increase and you can bet corporations won’t be clamoring to give workers such a raise. It’s disproportionate. I rather see the the focus be on helping those that want more out of life. Incent more businesses to invest in their employees’ educations, job training and health and wellness. Provide opportunities for growth that are worth going for…that will help create a more productive society. In my country this only benefits the State, since they are calculating the taxes based on this minimum income. The companies don’t care that much, the wages are still very small in most cases. I used to be on the side of the fence that maintained that there’s no reason for a minimum wage….but….I’ve changed my perspective. Anyone that works 40 hours a week should earn enough to pay for basic life necessities. That’s just how our society should work in our opinion. The reason there’s such a resistance to move it up to that level is because it would have to jump SO high that it would affect profits and prices, etc….but that’s due to inaction by the government. It should have been incrementally moved more often. Just as an FYI….while I understand the view point of “why should the uneducated make $15 an hour at a fast food restaurant,” I challenge anyone of this opinion to work in a fast food restaurant during an extremely busy lunch/dinner hour and then make a statement as to whether they deserve $15 an hour….. Interesting points here. There’s a huge number of benefits to raising the minimum wage – and I think it’s important for people against it to look into how hard most of these minimum wage jobs are. When minimum wage rose by a dollar in California in July 2014, I immediately began getting repeated recording calls from our utility company warning of higher rates coming in August, and encouragement to call them if I wanted to talk about it. I finally did call, being tired of the calls, but there was no real purpose in calling aside from that. The agent was nice enough to talk to, especially as compared to talking with cable company customer service! At the same time, we got notice of our rent rising $60 monthly beginning in August. My husband’s company gave him a raise later, but it was less than half what minimum wage earners got. And minimum wage will be raised again by a dollar in 2016. What does this mean? Those who receive these raises to minimum wage do not benefit, as those at the top want this money as their own and are in a position to get it by raising the costs that we all have. From my own observation, the costs increase more than the wages, and it affects the economy as a whole. I haven’t spoken with any minimum wage earners, but often see proponents of minimum wage hikes. I do have to wonder whether those working for minimum wage and receiving these raises are happy about it, because I think it’s possible that they may have both less awareness of personal finance, and a poverty mentality that causes them to expect to be continuously in need. The minimum wage exists entirely to buy votes for the left. I mean, uh, you know, it’s to… keep those greedy businesses from paying their employees only 1 cent per hour, of course! I am not knowledgeable about increase in minimum wage. But, what I know of is that raising wages reduces costly employee turnover and increases productivity. It’s ridiculous that minimum wage workers in this country can’t afford to live on their paycheck. And the corporations protesting the rise in cost need to remember that more income means more people with money they can spend on non-necessities. I believe studies have shown that a higher minimum wage actually improves the economy. While everyone needs to get paid a wage to work, I don’t think $15 is the answer. I think when you raise the wage by this much, you are going to have consequences. What about all of the people currently making $15/hr? Will they get a raise too? What about costs? Businesses won’t just eat these costs. On the other hand, this could work out well. Our economy runs on consumption, meaning the more people spend, the better the economy is. Since most low wage earners spend almost all of their pay, raising the minimum wage only adds more money to the pot to spend, helping the economy out.